Do Tax Deferred Investments Save You Money? Tax season is upon us. But before you pull out that old box of receipts and get to work, you might want to look into whether tax deferral could save you money, in addition to buying a little extra time. Tax deferred accounts allows you to not pay taxes on your gains in an investment until you withdraw the money. The most common form of a tax deferred investment is an Individual Retirement Account (IRA) or a deferred annuity. Let’s say you put money away for your retirement in a type of deferred annuity called a multi-year guaranteed annuity (MYGA). A MYGA functions much like a Certificate of Deposit (CD), in that it grows your money at a specified interest rate for a period of time. Because the MYGA is classified as non-qualified retirement instruments, you will not pay taxes on the growth of your money until you withdraw it for your retirement. And because most people fall into a lower tax bracket when they retire and stop receiving their primary income, withdrawing money from an annuity after retirement may allow them to save significantly on their taxes. In contrast, a certificate of deposit would pay interest to you every year, but it is also taxed on a yearly basis, whether you withdraw the money or not. That means you pay the IRS annually on the interest that the CD pays you, leading to higher taxes over time. Now let’s take a look at how tax deferral works by examining two key scenarios. John is 55 years old. For the next 10 years he puts $100,000 into a CD and $100,000 into a MYGA deferred annuity that grows tax deferred. They both grow his money at the same yearly rate of 2.65%. 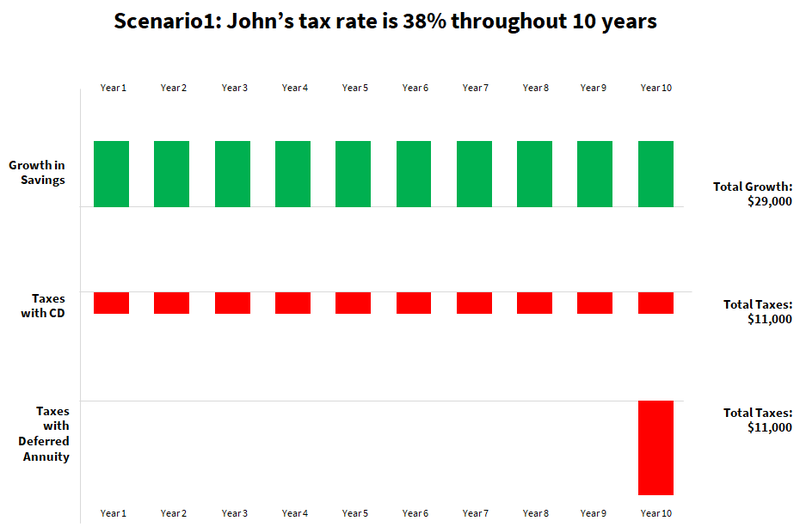 John’s current tax rate is 38% and we assume it stays at the same rate even after 10 years. Let’s look at what would happen with both a CD and MYGA deferred annuity. During this ten years, John’s tax rate remains constant at 38%. Over the course of those ten years, his CD’s value would increase from $100,000 to about $129,000 (total growth of $29,000), with him paying roughly $11,000 in taxes over the course of his term. This would bring the net value of his CD to about $118,000 at the end of the 10 years. Because John’s tax rate remained constant, the value of his MYGA deferred annuity would end up the same ($118,000) as his CD, with John paying the full $11,000 in taxes at the end of his term, rather than over the course of the full ten years. In this scenario, both the CD and the annuity have the same value; the taxes are just paid differently. 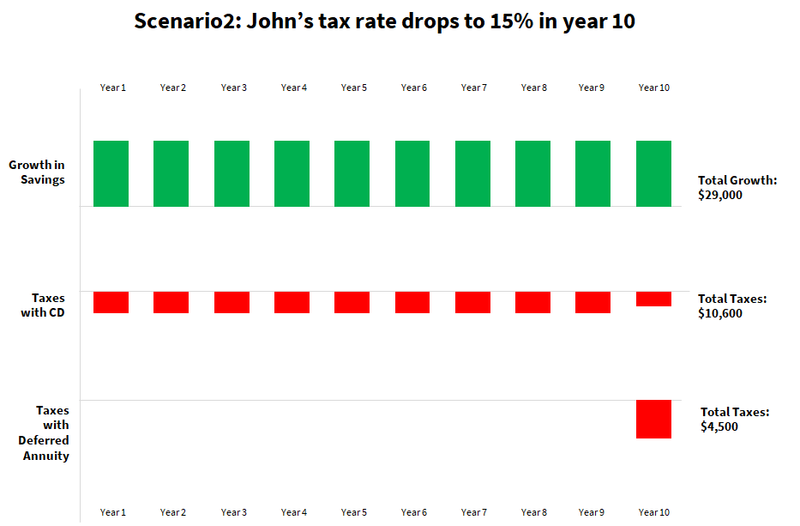 Scenario 2 is the same as scenario 1 except that we assume John’s tax rate drops to 15% in year 10 when he retires. In this scenario, the MYGA deferred annuity would generate about $6,000 more than the CD. That’s because with the CD John would have been paying a steady 38% in years 1-9, and 15% in year 10, totaling $10,600 in taxes over time. With his MYGA deferred annuity, he only pays taxes in year ten. This mean he will be taxed on the total growth of $100,000 to $129,000 at the 15% rate, resulting in a tax bill of $4,500. Clearly, an annuity was useful here as it saved him over $6,000. It can be complicated to figure out whether tax deferral saves you money. However, as we saw above, making the right decision can lead to a greater return on your investment and a more secure financial future. If you are currently in a high tax bracket, but expect to be in a lower tax bracket in the future, this can be a smart way to increase your post-tax returns.